Miss France, Iris Mittenaere (23), was crowned the 65th Miss Universe in the Philippines earlier today. She was crowned by the outgoing title holder, Pia Wurtzbach from the Philippines. She is the second winner from France and the first since 1953. Mittenaere's win is also a major triumph for Europe. The last European won in 2002 when Russia's Oxana Federova was crowned Miss Universe, but as she was dethroned, it's Europe's first Miss Universe title since 1990. Miss Haiti, Raquel Pelissier, was the major surprises of the night. She finished as the first runner-up and will assume the duties of Miss Universe, should then new winner be unable to complete her reign. The second runner-up was Miss Colombia, Andrea Tovar. 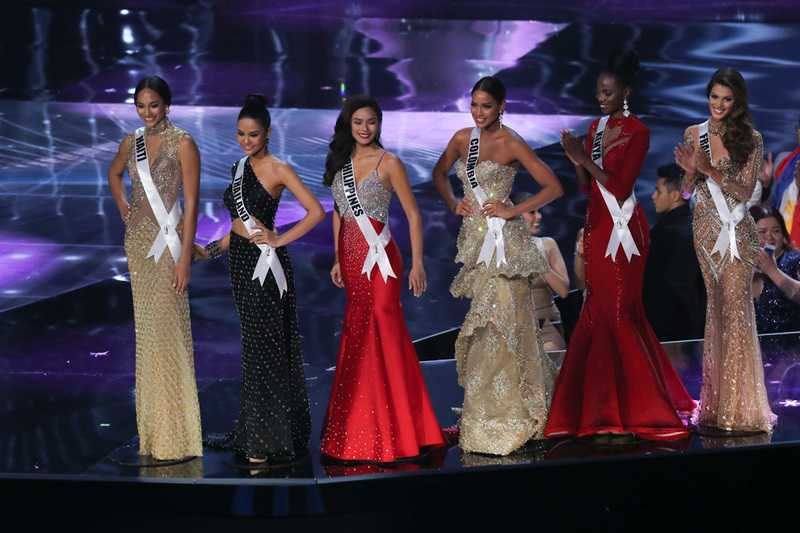 The top 6 were completed by the delegates from Kenya (Mary Esther Were), the Philippines (Maxine Medina), and the winner of the global fan vote, Thailand (Chalita Suansane). Miss Canada, Siera Bearchell, Miss USA, Deshauna Barber, and Miss Mexico, Kristal Silva, advanced to the top 9 before being eliminated after the evening gown round. Misses Brazil (Raissa Santana), Indonesia (Kezia Warouw), Panama (Keity Drennan), and Peru (Valeria Piazza) advanced to the 13 before being cut after the swimsuit round. Miss Myanmar, Htet Htet Htun, was named the winner of the Best National Costume. I absolutely love the new winner and so happy that a European finally won again! Haiti was a nice surprise. Overall really good results. Sad for Brazil though. And also for Miss Argentina. Love her but hate the gown, much prefer the one she wore in Prelims. I was surprised with the Miss Universe 2016 competition this year due to how things looked before it aired. I saw two walls built during the Preliminaries consisting of the South Americans with Peru, Brazil, Colombia, and Venezuela competing against the Asian/South Pacific wall with Thailand, Vietnam, Philippines, Australia, and Indonesia being among the strongest delegates with Puerto Rico, Mexico, France, and Ukraine completing my Top 13. But then seeing Kenya, Haiti, and Canada edging out huge favorites floored me with the USA and Panama being questionable of making it to the Top 13! This year ended up with the North American wall that was built by 5 reaching the Top 13! During the announcement of the Top 13 I loved that interviews was done by Mr Harvey which I wish they would have been scored on. Then seeing Brazil ( I too thought she was Top 3 with Thailand and Mexico) eliminated early floored me! Then the shocks continued with Haiti and Kenya advancing to the Top 6, Thailand being eliminated in the Top 6, Colombia making it to the Top 3 finishing third, Haiti (who I thought won it all) and France winning just made my jaw drop!! But overall, France deserved winning!!! It is now going to be interesting how the power of the sash factor for every country may be changing in the upcoming years!! Powerhouses like Australia, the USA, and Venezuela may now be humbled through the next few years while countries who never made it to the Top 13 may be crowning winners soon!! I will admit while watching the first cut that I noticed how Venezuela's head was down so much and I truly felt sorry for her because I really thought she would make it past the first cut. But overall, with the exception not seeing the Finalist competing one at a time and competing in groups did stink some. Congratulations France on breaking their long drought and winning Miss Universe 2016!!! Miss France truly deserved the crown as she performed exceptionally well in all rounds.Apart from that Iris seems genuinely beautiful girl with a good attitude and personality, although I didn't like the new format its were all ended with the crowning of this lovely lady,I wish you all the very best Iris!! !congrats France!! !